That quote was said in 1994–many of you were probably born in that year! Life has changed a lot since then. When that quote was said, I was an early teen. Kids were not as busy then. Parents were not as busy then. Families were not as busy then. We weren’t distracted by the Internet at all, much less the Internet in our pockets. I think it has long been human nature to give our best to the world. We look our best for those outside of our homes. We act our best. We are more patient. We show more grace. As parents of young children, we often feel trapped in monotony. Life is the pretty much the same day in and day out for many years. We start to feel a little disconnected from the world (and so we cling to those electronic devices like a lifeline!). We feel like we aren’t contributing much. We think about serving others and will learn about the importance of service at church and feel guilty because we are so focused on our little families we rarely think of those outside of our home. We need to always remember that serving our families counts as service. We need to cut ourselves some slack. 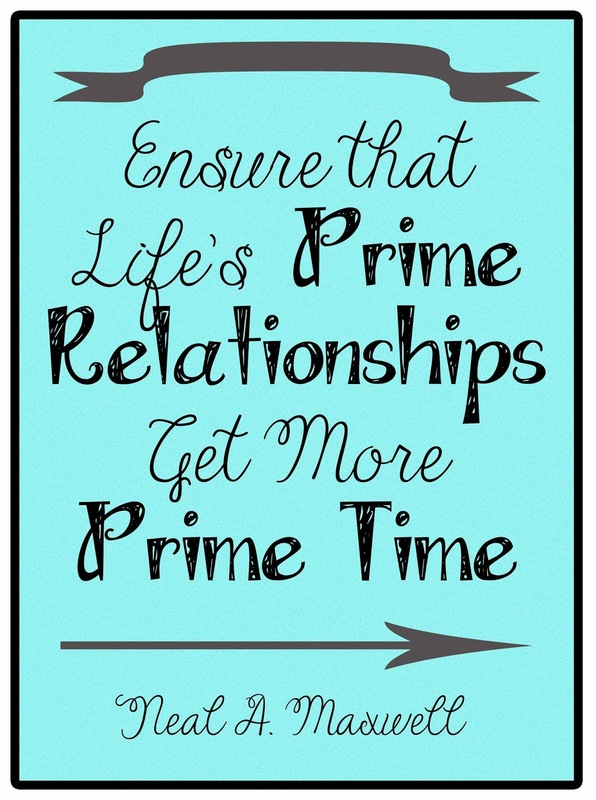 We are giving our prime relationships our prime time. At the same time, of course we want to show our children good examples and teach them to serve others. We don’t want to turn our backs on the world around us. Life is a fine balancing act, and consistent evaluation of how we are doing will help us make those minor adjustments as we need to. 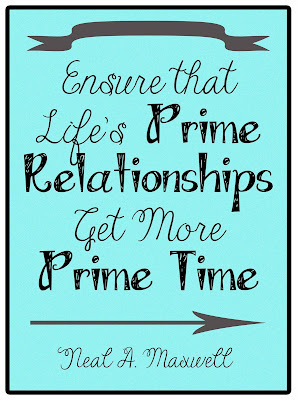 As you choose how to spend your time, be sure you have things balanced so your family can and does get your prime time. Set limits on yourself to do so. Say no if you need to. There is no blanket answer here. We can’t say X number of hours is correct to be devoting to your family. We can’t say “Do only ABC number of things that aren’t focused on your family.” The answers will vary from person to person. Be prayerful and mindful of how to spend your time and you will know if you need dto give more outside or less outside your family.